by Dino Martens (for Aureliano Toso). 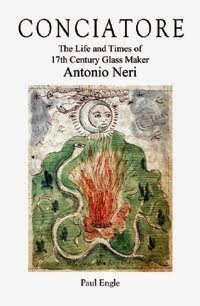 Filigrana is a classical glassmaking technique developed in the sixteenth century on the Venetian island of Murano. 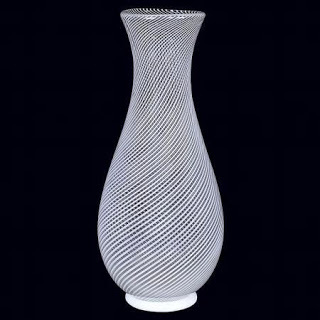 In the broadest sense, a piece of filigrana -- let's say a vessel -- is composed of transparent glass with very fine vertical threads of color running through it. Traditionally, these threads were opaque white lattimo (milk) glass, running through a colorless high quality product known as cristallo. Because of this, the technique was originally known as “latticino,” a term still in use, but now falling out of favor and being replaced by filigrana (filigree), a name that does not imply any particular color. Over the centuries, this and closely related techniques became a kind of trademark for the Murano glass industry. Parallel threads in a loose spiral winding around a vessel from top to bottom form what is perhaps the most basic application of the method. This is known as mezza filigrana (half filigree). The reason for the “half” becomes apparent when we consider its far more famous cousin reticello. With this technique, two sets of threads are used winding in opposite directions to form a fishnet pattern of diamonds. The name recalls reticella, a traditional Venetian lace. When the work is done properly, tiny air bubbles are trapped inside the glass, one in the center of each diamond of the fishnet pattern. Even more exotic variations have been developed, which we will discuss another time. First, let's explore how the glass artisan is able to achieve these fine threads in the glass, so perfectly spaced. I should hasten to say that I am not a glassblower and this description is not an instructional, but simply a window into some of the fabulous artistry that takes place in a glass shop. These techniques take hundreds or thousands of hours of practice to master. Even a shallow understanding of the steps that go into a piece of filigrana lead to a far richer appreciation than simply being able to identify it by name. “Cane” is a general term for long straight rods of glass. They have many uses in glass artistry and the method by which they are made can be surprising the first time you see it done. It is the same method as was practiced a thousand years ago. A gob of molten glass is removed from the furnace on the end of an iron rod. A second rod is attached by another artisan, with the lump of molten glass between the two rods. They start to pull in opposite directions, slowly at first. They swing and manipulate the hot glass as it cools, forming a mass of relatively uniform diameter. They continue to walk away from each other, the glass pulling thinner as they go. Practiced artisans can end up with a uniform pencil thin straight rod of glass that extends for many meters. It is laid on spaced wooden slats on the floor, allowed to cool and then snapped at regular intervals to form smaller rods. in the style of filigrana, by Emilio Santini. Outside of the hot shop, there are methods that use only a torch to duplicate the appearance of filigrana and reticello on a smaller scale. This involves starting with glass tubing and "painting" the threads on using thin "stringers" of glass. It is a completely different technique which requires an entirely different set of skills. In the right hands, the results can be strikingly similar. Now that we have the basics down, we can discuss the more spectacular variations that have been developed, which we will talk about next time. "Colletto"(Italian) "Coeto" (Venetian), means narrow neck or little neck.